In February 2013 we interviewed a band from Canada called the MUDMEN. As you will read below, they have a considerable legacy. One of their tunes is posted on our Free Music tab. This Celtic Guide article is something I have wanted to do for quite awhile – to feature modern day Celtic musical personalities. Our February cover shows two members of the Canadian Celtic Rock band, the MUDMEN, meeting with the Queen of Great Britain. Nothing says “pomp and ceremony” more than a royal event. When one meets the Queen, it may not necessarily be solemn, but it is certainly a ceremony that follows a prescribed form, laced with awe and reverence. It strikes me that the two gentlemen shown on our cover – brothers Sandy and Rob Campbell– are so physically imposing with their kilts and strong forearms and yet the mild mannered, small, and, dare I say, elderly Queen is imbued with so much more power. Thus is the case with ceremony - the process of which often adds a sense of power to circumstances, people and things that might otherwise seem ordinary. However, there was nothing ordinary in this case, as the Campbells joined with Canadian country music star Johnny Reid to perform live for Her Majesty. 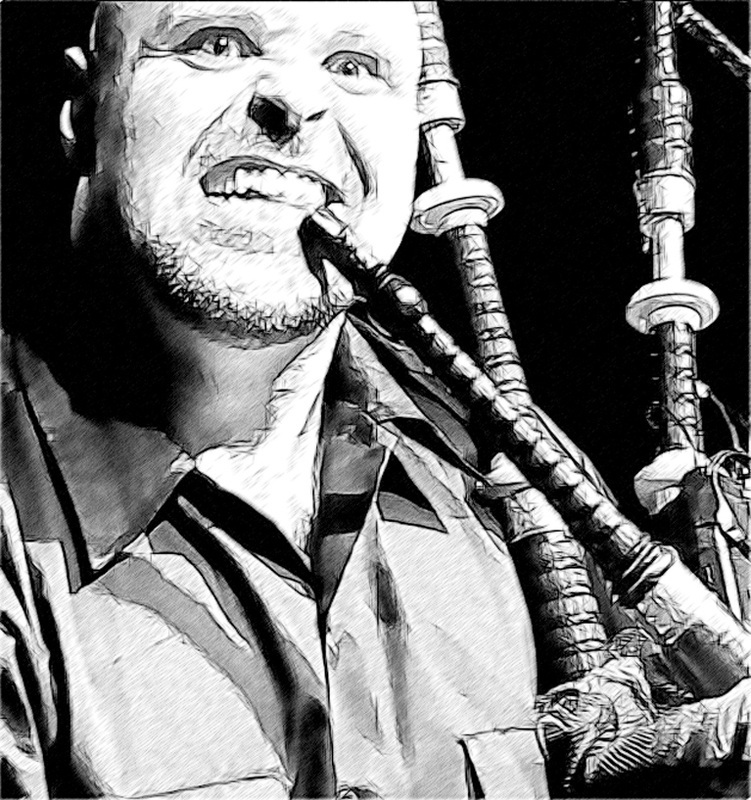 In our first ever Celtic Guide interview, we’ve asked Robbie Campbell a few questions about this event and about his legendary Canadian Celtic crew. CG: Welcome, Robbie, to you and your bandmates. It must have been quite an honor and experience to perform at a ceremony for the Queen of Great Britain? Robbie: Yes it was. When people ask us what is the highlight of our career it would most likely be meeting and performing for the Queen, with recording the Hockey Night in Canada Anthem coming in a close second. CG: Well, how did this all come about? Robbie: We got the call to perform with our good friend CMT country music star Johnny Reid and were announced by “Mr Canada” (and great MUDMEN supporter) Ron MacLean. The American band Blink182 once said they finally made their parents proud of them when they performed for and met President Clinton. I think that it was the same with our mom when we met the Queen. CG: Oh, is your mother a fan of the Queen? Robbie: Our mom, who is of Scottish-British descent, is perhaps one of the biggest supporter of the royal family. She prepped us for the “meet and handshake.” I remember looking over onstage and seeing the Queen also sitting there . . . certainly a once in a life time moment.Our mom said the Queen broke into her biggest smile when Johnny, and my brother Sandy and I performed that day. CG: What sticks in your memory most about the event? Robbie: Well, Jim Cuddy, of the legendary Canadian country band, Blue Rodeo, once said that we achieved the two accomplishments that every Canadian musician had on their bucket list - meeting and performing for the Queen, and having our MUDMEN songs showcased on hockey nights in Canada. One thing in particular, I remember from that day, was counting over 20 snipers standing on roof tops, armed to the max! The Queen was in no danger. CG: Then it was quite an honor to be there? Robbie: Don Cherry was my childhood hero and has been a long-time friend. He was a Canadian hockey legend and a former Boston Bruins coach. He says that the Queen’s picture should be hanging in every hockey arena, every legion, and every school in Canada . . . and I agree. The royal family is a huge part of our history and shouldn’t be forgotten. Only a lucky few ever get invited to perform for the Queen. My brother Sandy, myself, and the rest of my MUDMEN bandmates were honored to add this accomplishment to our resume. CG: And I see by that resume that, as fantastic as the event with the Queen was, you have an extremely long list of accomplishments as a Celtic band. Robbie: Our resume is very good . . . and very long. We have been lucky enough to perform with or open for some very well known acts. We’ve opened for ZZ Top, The Guess Who, Nazareth, and many more, and we’ve toured with The Irish Rovers, The Chieftains, John McDermott, John Allan Cameron, and others and especially with Johnny Reid on his 2012 Cross Canada Tour, and at other events. CG: I see you and your music have appeared on TV many times. Can you tell us about that? Robbie: The MUDMEN have appeared on CBC television many times including multiple performances on Parliament Hill for Canada Day festivities. We appeared on a “McKenzie Brothers” special, and performed/provided music for the 2010 Canadian Country Music Awards, an Edmonton Oilers home opening (on CBC), music for an NBC “Black Donnollys” commercial, for HBO’s “Shameless” TV show, A&E’s “Sports Game Burnout Three” and their “ATV vs Off-Road” plus many other significant performances and recordings. CG: Earlier, you mentioned providing music for hockey night in Canada. You’ve mentioned a couple of events already. Can you tell us more about your link to hockey? Robbie: Yes, we recorded the new Hockey Night in Canada theme song and were part of Bob Rock’s CBC special for this anthem. We’ve performed at three Grey Cup parties, in Toronto, then Calgary, then back to Toronto. In fact, we’ve been all over Canada playing at events from London to Sakatoon, to Niagara Falls. Of course we don’t want to leave out wrestling as we also provided the entrance music for the professional wrestlers “The Highlanders”. CG: It sounds like you’ve had an impressive and varied career in performing live Celtic music. How about studio work? CG: So I guess the one question still burning in our reader’s minds is – Where did you get a name like the MUDMEN? Robbie: We started out as The Campbell Brothers because that’s who we were. When we were signed to EMI Music and hooked up with Pro Management and Feldman’s booking agent, they wanted us to change our name to something a tad less traditional, giving us a bit of an edge. We were literally mud men working with a bricklaying crew, mixing mortar and carrying bricks, so we mentioned the name MUDMEN, and just like the mortar we carried, it stuck!